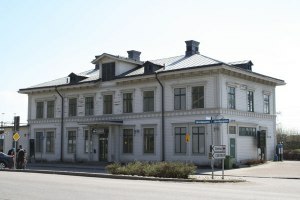 Hotell Lilla Station, built in 1877 and designed by architects brothers Axel and Hjalmar Kumlien, located in the historic center of Köping. There are many beautiful old buildings and neighborhoods to explore. Most of Köpings museums are also gathered here if you would like to visit them. Köpings car museum, about 100 m from the hotel, is one of Västmanland best for the automobile enthusiasts. Directly behind the station we have the marina, which expires at the lake. You can actually take the boat here all the way from Stockholm. A pleasant summer evening, is a walk in the beautiful harbor one of the better opportunities for recreation in the vicinity of the station. Porttavern Athos has outdoor seating for those wishing to sit for a while. One can also go up in our beautiful beech forest in the recreation area just a few hundred meters away, stroll in the forest park and watch the carp in the lily pond. Only a few steps from Hotel Lilla Stations entrance, is the famous restaurant Ögir, which arranges popular music, including "Kompledigt ", an annual song festival. Ögir also serves lunch and a la carte every day. For those interested in culture, we recommend Hagateatern and Forum which is located downtown.